Filled with a hearty beet (not beef!) and feta, this vegetarian patty will satisfy even the biggest of meat eaters. 1 large (200g) red onion, finely diced. 1 cup gluten-free plain flour (or regular plain flour if you prefer). 6 sourdough bread rolls, cut in half. 1 head cos lettuce, leaves washed and roughly torn. 2 large (200g each) tomatoes, thickly sliced. 1. Add all ingredients for the Beet Patties (except for olive oil) into a mixing bowl. Combine mixture together with your hands (use rubber gloves if you don't want bright red hands!). 2. Heat olive oil in a frying pan over medium heat. Divide the mixture into six and scoop into the pan (in batches depending on the size of your pan). The mixture will be quite wet, so mould two patty shapes, about 1.5 cm thick. Cook for roughly 7 minutes until the bottom side is crispy. Once nicely browned, flip and cook on the other side for 5 minutes. Once cooked, set aside and repeat with the remaining mixture. 3. Now to assemble your burgers. 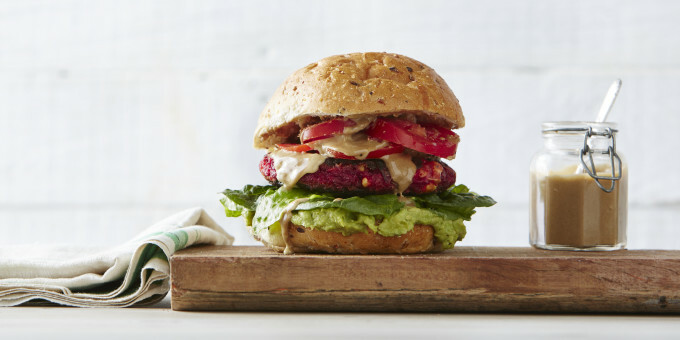 Layer the base of your burger buns with mashed avocado, lettuce, one Beet Patty and tomato slices. Drizzle with some tahini to finish. Paleo option: Swap the flour for almond meal. For the buns, roast 4 large flat mushrooms in an oven on 180ºC for 10 minutes. Remove the stems on each mushroom and use as burger buns. Replace the feta with 2 tablespoons Pumpkin + Sweet Potato Puree. If you do make the Paleo substitutions above, we recommend serving with an extra tablespoon of tahini to up the calcium content of the dish. Gluten-free option: Use gluten-free bread instead of buns. Want to eat delicious recipes like this every week? Click here for more! Dairy-free option: Replace feta with 2 tablespoons of Pumpkin + Sweet Potato Puree. If you do omit dairy, we recommend serving with an extra tablespoon of tahini to up the calcium content.